Is The American Dream God's Dream? Editor's Note: HuffPost Religion is running a series of posts by Sojourners' Director of Mobilizing Lisa Sharon Harper and D.C. Innes, her co-author on the new book, Left, Right and Christ: Evangelical Faith in Politics, about how Christians should view social issues. The second issue is: "Is the American Dream God's dream? I've been hearing a lot of talk on all sides about the American Dream lately. This has pressed the question: Is the American Dream God's dream? 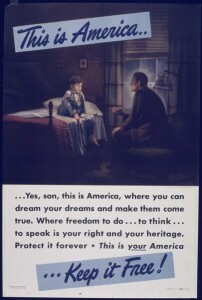 The American Dream traces its roots to the United States Declaration of Independence. Our forbears declared: "We hold these truths to be self-evident, that all men are created equal, that they are endowed by their Creator with certain unalienable rights, that among these are life, liberty, and the pursuit of happiness." People of African descent were denied their liberty, their happiness, and sovereignty over their own lives in the antebellum south in order to secure the "happiness" of British descendants bestowed, by law, the mantle of "master" class -- literally. For most of the 19th century the U.S. removed native peoples from their lands. The lives, liberty, and happiness of every Native American nation was decimated so that white miners and settlers might pursue their "happiness." 12,000 Chinese workers laid the western half of the First Transcontinental Railroad; securing the "happiness" of American commerce. But Chinese workers were excluded from the right to become citizens and in Oregon they were excluded from the right to own land. The American Dream has always been at odds with itself, but our chosen economic system of the last 30 years has dragged America farther away from its common dream of equality. In the past, economic policies like the Homestead Act of 1862 and the G.I. Bill of 1944 served to bolster and secure the lives, liberty, and happiness of at least the white middle class. But in 1980 Ronald Reagan ushered in a torqued up brand of capitalism to our economic system. Neo-liberal free-market capitalism embedded the ideological language of deregulation and market sovereignty into our economic lexicon. Within eight years the American Dream was deposed by the dream of corporate liberty and oligarchy. A recent Congressional Budget Office report revealed from 1979 the average income grew by 275 percent for the 1 percent of the population with the highest income. The top 20 percent's income grew by only 65 percent. By contrast the poorest 20 percent's income rose by 18 percent. Nobel Laureate, Joseph Stiglitz, points out that the top one percent owns 42 percent of all wealth (net worth minus the value of one's home) in the U.S., while the bottom 80 percent owns only seven percent. Last year top CEO salaries were up 23 percent, but the average worker only saw a .5 percent rise. Then consider, nearly 50 million Americans are currently living below the poverty line (that is $22,000 for a household of four) and half of them are working full time jobs. In our current economic system, the "happiness" of the super-elite is secured while the lives, liberty, and access to basic needs of the rest suffer. This isn't the American Dream and it isn't God's dream either. The feeding of the 5,000 (Mark 6:30-44), the institution of the sacrament of communion (Luke 22:14-23) and the movement of the Holy Spirit to create a commonwealth (Acts 2 and 4) reveal God's sacred dream of the common good. At God's table all people are equal and therefore equally worthy of life, liberty, and happiness -- yea, even flourishing. Left, Right and Christ: Does God Want You Rich? Is the American Dream God's dream? It's a fair question and a provocative one. But what exactly this question is asking is unclear. Is it asking if the hope that America holds out for opportunity seekers is identical with God's redemptive purposes in Christ? Clearly, the answer would be "no." But why would anyone compare the two? It's worth a deeper look. The American Dream is generally associated with social and economic rising with a view generally to modest suburban comfort. You arrive with a cardboard suitcase and three dollars in your pocket and you end up with a thriving business. You start out sharing a bedroom with three brothers in the moral squalor of a Brooklyn tenement and you end up with a big backyard and a pool on middle-class Long Island. With hard work and opportunity, you can make it here. The American Dream. There is nothing necessarily ungodly in that. When God brought Israel into the Promised Land, God promised them security against their enemies and a land flowing with milk and honey (i.e. fat and plentiful livestock and flowering fields atop rich, productive soil). God promised them prosperity! God has given us a potentially rich world that God wants us to develop and enjoy in human dignity and worshipful gratitude. 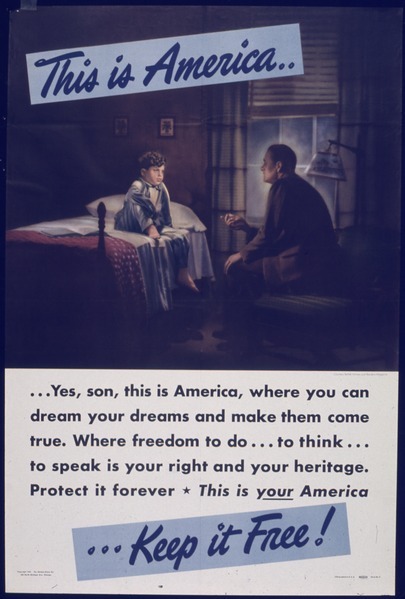 In that respect, one may reasonably say that the American Dream can be a godly dream -- part of what God offers human beings somewhere on the other side of Christian repentance and faith. On the other hand, God warns us not to trust in wealth. The apostle Paul writes, "People who want to get rich fall into temptation and a trap" (I Tim. 6:9). God told Israel that even the enjoyment of the wealth God would give them would be morally dangerous. "Beware that you do not forget the Lord your God ... Otherwise, when you eat and are satisfied, when you build fine houses and settle down, and when your herds and flocks grow large and your silver and gold increase... then your heart will become proud and you will forget the Lord your God" (Deut 8:11-18). The reason God packaged God's good and generous gift with a spiritual caveat is that God's gospel, whether to Israel or to you, is not a health and wealth gospel. The gospel is Christ, and the Christian's chief enjoyment is not the creation but the Creator. It is a chastening reminder to my fellow lovers of liberty that while life is severely stunted without political and economic liberty, there is more to life than politics and economics. It is also a reminder to my liberal friends like Lisa, however, not to despise God's good gift by redistributing it under constraint instead of further unpacking it in liberty.